The first action to redevelop Jacksonport’s Lakeside Park took place at the May 6 meeting of the Parks Committee. The committee made several recommendations to the town board, including the removal of the house on a newly acquired expansion to the park, locally known as the Koulias house. A condition assessment by Kontext Architects from Madison determined the building to be in fair condition with an adaptive reuse cost of $175,000 to $200,000 for a three-season building. The town was exploring the option of rehabilitating the house into a public restroom and community center, but committee members felt this cost was too high for a building that seemed to be falling apart. The committee moved to recommend the town board dispose of the building while moving one of the garages on the property further south to the property line. The garage, along with a second adjacent garage, will receive a new foundation and new roof if approved by the town board. 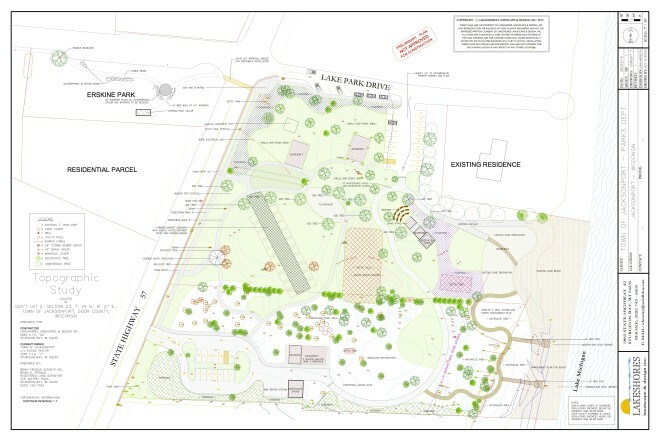 The committee moved on the Koulias house and garages because the buildings were outside the scope of the Knowles-Nelson Stewardship grant that the town applied for to fund the Lakeside Park project. Until the town hears back on the status of the grant in September, they cannot move on any enhancements or redevelopment that those grant dollars might touch. “I think we’ve all been frustrated with the process of just waiting, waiting, waiting because we can’t spend anything before we get that final contract, assuming that we actually get the Knowles-Nelson grant,” said Dawn Craig, committee chair. This unknown played into the decision to remove the Koulias house, as the rehabilitation of the building would eat up the entire fund that the town has set aside for the project. As of the May 6 meeting, the town has secured $193,866.40 for the project. The fund includes a $50,000 commitment from the town, organization pledges and an anonymous local grant for $100,000. Those funds are not even enough to cover the estimated cost for new restrooms and a sanitation system, the priority for the redevelopment, according to Craig. Without the Knowles-Nelson grant, which would match the town funds for the project, other park enhancements such as parking improvements on the north and south ends of the park, a walking path, farmers market stand and landscaping might not happen. Craig is optimistic that the town will receive the grant after the grant writer, Dan Johns from Vandewalle and Associates, said he had never received so many letters in support of a grant. Twenty-nine individuals and local groups, including the Jacksonport Area Business Association, Jacksonport Women’s Club, Kangaroo Lake Association and the Shores of Jacksonport Neighborhood Association, wrote letters in support of the grant. Craig is also pursuing other grants for the project, such as the Thomas O. Brown Fund, which has supported The Ridges Sanctuary, and the grant program through Nicolet National Bank. “Part of the goal can be to reduce the town’s $50,000 donation, if we can save that money for something else,” said Craig. In the original biennial state budget presented by Governor Scott Walker in early 2015, the Knowles-Nelson Stewardship Program would have been frozen, eliminating any chance at securing grant funds. But even after being restored to $33 million, there are fewer grant dollars available than in past years, making the applications more competitive. If Jacksonport is awarded the Knowles-Nelson grant, they will sign a contract for the grant and the funds will become available in spring of 2017. Craig believes they will then be able to work on the park throughout 2017. The Jacksonport Town Board will consider the recommendations on the Koulias house at its monthly meeting on May 24.